Main gear of the front axle is made of 2 bevel gears with circular teeth.. A pinion gear mounted in glass on two ball bearings. The driven gear is included in the differential assembly and fixed on the differential housing with bolts and pins. The differential of the front axle makes it possible to rotate the drive wheels on one corner speed you need when driving on uneven surfaces, and at the time of the maneuvers. He also transfer case -. Is required to transfer the drive with manual front axle. 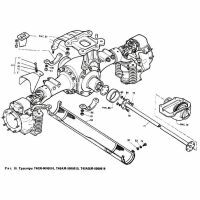 The final transmission of the front axle is used to increase the torque and reduce the rotational speed, to give the front drive wheels 40 T-ASM, and T-40 AM. The final transfer of any other than the single-stage gearbox with spur gears. Front axle suspension in the T-40 AM need to improve ride comfort and reduce vibration. The bracket can be rotated, thereby the rotation of the front wheels is performed.